Oklahoma Connection | McGee came to work at Phillips Petroleum Company in Bartlesville, Oklahoma, around 1927. In 1947, Dean McGee led his Kerr-McGee Oil Industries, Inc., in bringing in the world’s first commercial oil well out of sight of land in the Gulf of Mexico. It would launch the offshore oil industry and put his company in the lead in offshore drilling technology. Dean Anderson McGee was born and raised in Kansas and graduated with a degree in Mining Engineering from the University of Kansas in 1926. He taught a course in geology before joining Phillips Petroleum Company as chief geologist. In 1937 he resigned and was named vice president of Kerlyn Oil Company, originally created by Robert S. Kerr and R. H. Lynn in the 1930s and the predecessor of the Kerr-McGee Corporation, which was created in 1946. 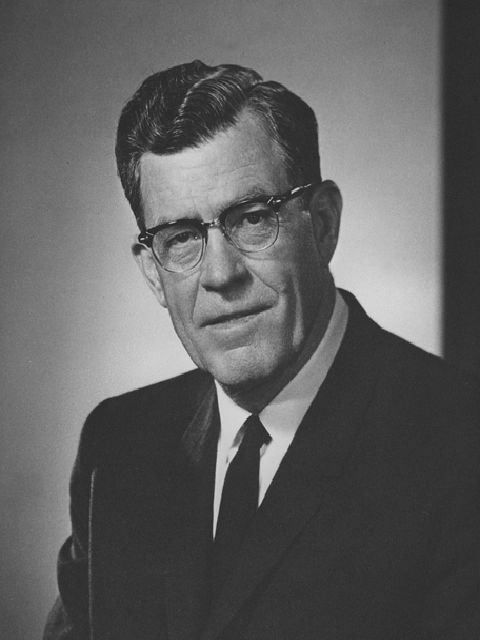 He became executive vice president of the company in 1942, president in 1954, and finally chairman of the board and chief executive officer (1963-1983). McGee received numerous awards throughout his life including the Sidney Powers Memorial Award from the American Association of Petroleum Geologists, the Human Needs Award, and the Gold Medal for Distinguished Achievement from the American Petroleum Institute. He was a powerful corporate citizen and community supporter of such organizations as the Oklahoma Health Science Foundation, the Oklahoma Medical Research Foundation, and the Dean A. McGee Eye Institute.